Dubai – 25 June 2018: Marking the International Day against Drug Abuse and Illicit Trafficking, which is observed on 26 June, Dubai Customs announced its latest figures for drug seizures made in January to 22nd June. It made 540 seizures: Coastal Customs Centre Management made 4 seizures, Air Customs Centre Management made 23 seizures, Land Customs Centre Management made 290 seizures, Jebel Ali Customs Centre Management made 7 seizures and Dubai Airport’s Passenger Operations Department made 216 seizures. There were different types of restricted drugs seized including the tramadol and captagon pills. Commenting on the latest figures released, Sultan bin Sulayem, DP World Group Chairman & CEO and Chairman of Ports, Customs and Free Zone Corporation said:” Protecting our society from illicit trafficking is a top priority for us. We are the first defense line to secure and save society, so we equipped our customs centers with the latest and most advanced inspection devices. These include the advanced Container Scanning System, the Smart Luggage Inspection System, among many others”. Bin Sulayem pointed out that these efforts serve and support Dubai 10X Initiative, which sees Dubai outpace other cities in services and technology by 10 years, and the forward thinking UAE Centennial Plan 2071 which aims to make the UAE the world’s leading nation by 2071 through a series of bold initiatives across a variety of industries. “Our efforts to protect society from the hazards of illegitimate trade integrate well with our work in facilitating legitimate trade in fulfilment of the vision of His Highness Sheikh Mohammed bin Rashid Al Maktoum, Vice President and Prime Minister and Ruler of Dubai of promoting Dubai as an international preferred trade and tourism hub”. 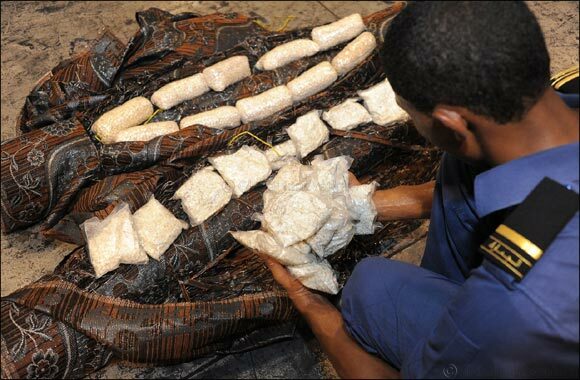 On his part, Director of Dubai Customs Ahmed Mahboob Musabih said:” We provide our inspection officers with hands-on training and the latest devices and technologies which enable them to prevent illicit trafficking of all types of drugs”. Dubai Customs uses advanced systems supported by the Smart Risk Engine which helps in finalizing 96% of customs declarations without any human intervention. The International Day against Drug Abuse and Illicit Trafficking is observed on 26 June, and it is an expression of the determination of different world organizations to strengthen action and cooperation to achieve the goal of an international society free of drug abuse. Building on the success of last year, the theme for 2018 is: 'Listen First - Listening to children and youth is the first step to help them grow healthy and safe.' It is an initiative to increase support for prevention of drug use that is based on science and is thus an effective investment in the well-being of children and youth, their families and their communities.